Heat the oven to 350°F. Stir 1/2 cup stuffing and butter in a small bowl and reserve. Spray an 11x8x2-inch baking dish with vegetable cooking spray. Arrange the pepper halves, cut-side up, in the baking dish. Stir the soup, sour cream, onion powder, spinach and Parmesan cheese in a large bowl. Add the remaining stuffing and mix lightly. Spoon about 1/2 cup spinach mixture into each pepper half. Sprinkle with the reserved stuffing mixture. Bake at 350°F. for 30 minutes or until the spinach mixture is hot and bubbling. 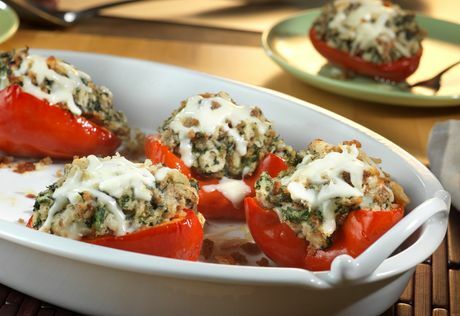 Top each with 1 tablespoon mozzarella cheese. Ingredient Note: To thaw the spinach, microwave on HIGH for 3 minutes, breaking apart with a fork halfway through heating.